�����Morgan Silver Dollars are preeminently the most popular and sought after of all U.S. collector coins. There are over 100 different Morgan Silver Dollars by date and mint mark; but there are hundreds more when you consider all the varieties that were minted. �����There are thousands of collectors who attempt to assemble an entire set of Morgan Dollars. Many dealers have purchased partially completed sets from those who decided it was almost impossible to complete the task. But how expensive is it to purchase an entire set? 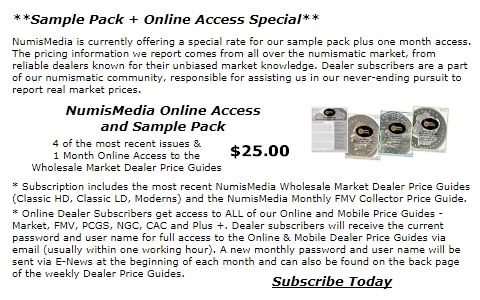 �����In March 2007 a complete set of MS63 Morgan Dollars as listed in the NumisMedia FMV Price Guide was $516,059. Today, that same set has an FMV of $620,088. That is an increase of over 20%. This, of course, doesn�t take into account the difficultly of acquiring each coin at the current FMV. The majority of these coins should be available at current levels, however, there are some that become progressively more rare as the quality increases. �����Below we have listed in order the top 15 dates by number certified (PCGS & NGC combined) in MS63. We have also listed the FMV of each date in March 2007 compared to the current FMV. �����All the listed coins advanced since 2007 with the exception of the 1894 which was down about 10%. This is likely the result of a disproportionate increase in the number of coins certified for the grade over this timeframe. These 15 coins make up $96,720 of the total increase in the FMV of the full set since 2007. This is an additional indication of how important these 15 coins are to the entire set. Further, if you remove these coins from the complete set of MS63 Morgan Dollars, the total value of the FMV for the remaining coins is just $67,128. If you look at the populations of these coins you will find that the majority of them are in the thousands for the MS63 grade. �����One important observation here is that there are only 12 coins certified in MS63 for both the 1892 S and 1893 S, thus there are only 12 possible complete sets of MS63 Morgan Dollars. When you consider that some of these MS63�s may be in sets with other higher or lower graded coins it makes the MS63 set a rather rare accomplishment. �����With so many collectors searching for the ultimate grade, we can also look at the availability (or unavailability) of Morgan Dollars with the highest value in MS65. The following chart shows how many coins have been certified, by PCGS and NGC combined, in MS65 and higher grades for each date. We have also listed the current FMV for each date in MS65. �����The above mentioned dates are by far the rarest of the high grades in the Morgan Dollar series. Eight of the nine dates have less than 10 coins certified in MS65 and higher and are nearly impossible to locate. Current owners of these dates know what they have and are not likely to let them go for anything reasonable. The 21 coins certified for the 1892 S would appear to be rather high for this rarity which could include some resubmissions. �����The FMV for the complete set of Morgan Dollars in MS65 listed in NumisMedia FMV Price Guide is $3,101,296. However, less than 10% of the coins represent over three-quarters of the total value for the set, once again emphasizing the importance placed on these top rarities and the difficulty in completing the ultimate set of Morgan Silver Dollars.